Mary Frances was born June 13, 1929 in Haskell, Texas, to Hubert Sego and Ethel Bledsoe Sego. She graduated from Haskell High School in 1946. Mary Frances worked as a bookkeeper for Lose Star Gas, John Deere, Dr. McSmith and Haskell Memorial Hospital. She was a member of Cornerstone Fellowship Baptist Church. She was an avid Dallas Cowboys Fan and enjoyed shopping. She was preceded in death by her parents, Hubert and Ethel; first husband, John Drey Lowe on January 5, 1993; daughter, Becky Douglass on March 17, 2010 and grandson, Wade Martin. Mary Frances is survived by her husband of 14 years, Larry Schonerstedt, of Haskell; daughter, Johnnie Ray Davis (Ron); step-sons, Randy Schonerstedt (Lisa) of Haskell, Rusty Schonerstedt, of Buford, Georgia, and step-daughter, Kimberly Pierce (Marty), of Hope Mills, North Carolina; Grandsons, Mark Ivy (Penny) of Wichita Falls, Texas, and Keith Ivy (Amber) of Aubrey, Texas; Cody Douglass; 7 great grandchildren; sisters, Joyce Davis, Frankie Alvis (James), and Flora Pace (Bud) all of Haskell; as well as numerous nieces, nephews, and friends. 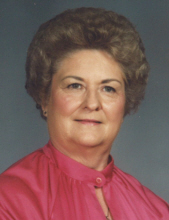 To send flowers or a remembrance gift to the family of Mary Frances Sego Schonerstedt, please visit our Tribute Store. "Email Address" would like to share the life celebration of Mary Frances Sego Schonerstedt. Click on the "link" to go to share a favorite memory or leave a condolence message for the family.